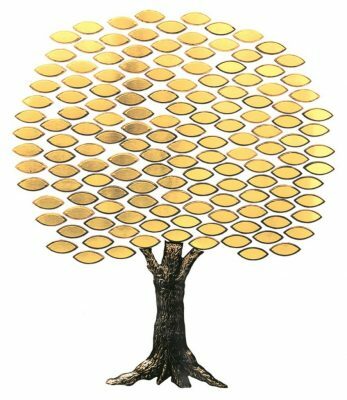 Trees of Life provide endless expansion possibilities to stimulate the interest of new donors. The basic premise is that you can assign different color and sizes to create Levels of Support. 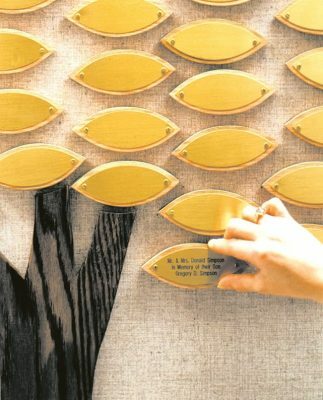 Major donors can be acknowledged using larger “ClassBrass” plates attached with screws to cast bronze stones. 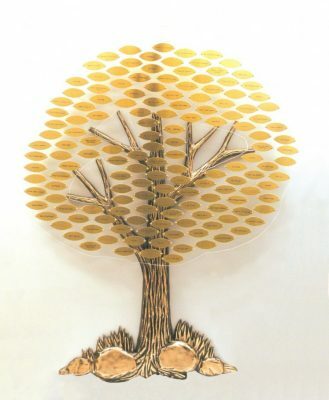 The bronze stones are normally mounted on each side or underneath the bronze tree trunk. Two bronze stone sizes are offered. These stones are essential in soliciting major gifts. 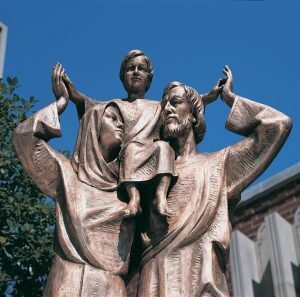 The combination of bronze and brass has a warm, elegant appearance. The Trees of Life project an image of quality and stability with their solid bronze trunk and class brass leaves. The bronze trunk is custom cast at our foundry. The Tree of Life class brass leaves are screwed into a clear acrylic panel that sits over the trunk and branches. 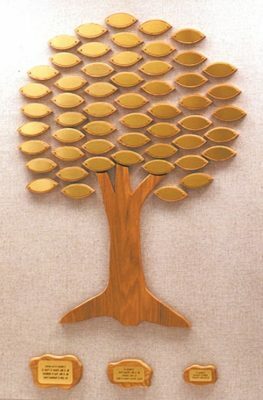 The acrylic panel(s) protrude approximately 1″ from the wall. All hardware is furnished for easy installation. 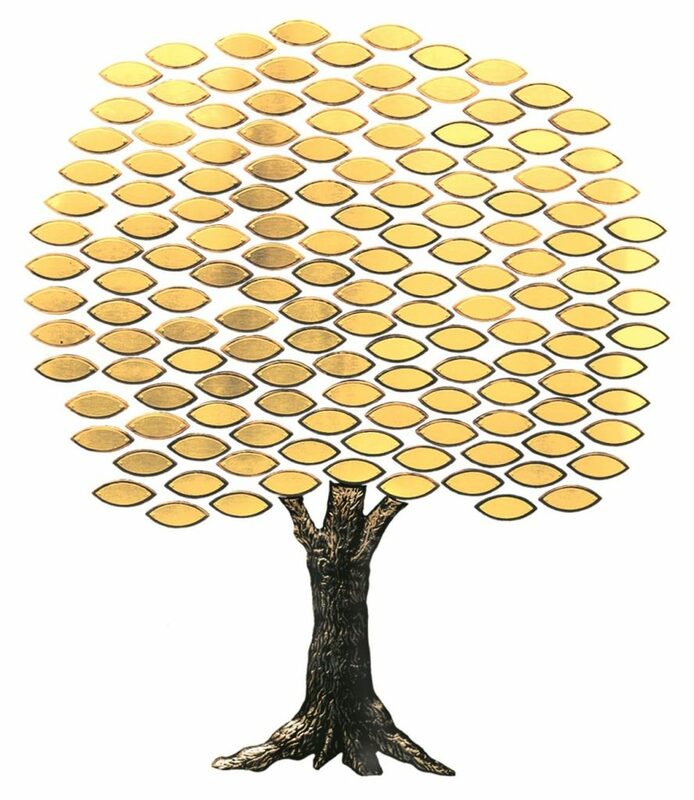 To have the leaves engraved, simply unscrew the blank leaves and mail them with a list of donor inscriptions to Zax for prompt return. Zax Corp. provides architectural signage and custom donor recognition products to organizations and businesses across the United States and Canada. We take great pride in our uncompromising craftsmanship, quality, and service. Each Zax product is a unique combination of element and design, created to meet your specific need and setting. We thank you for reviewing our product line. If there is anything that you do not see here, please contact us.